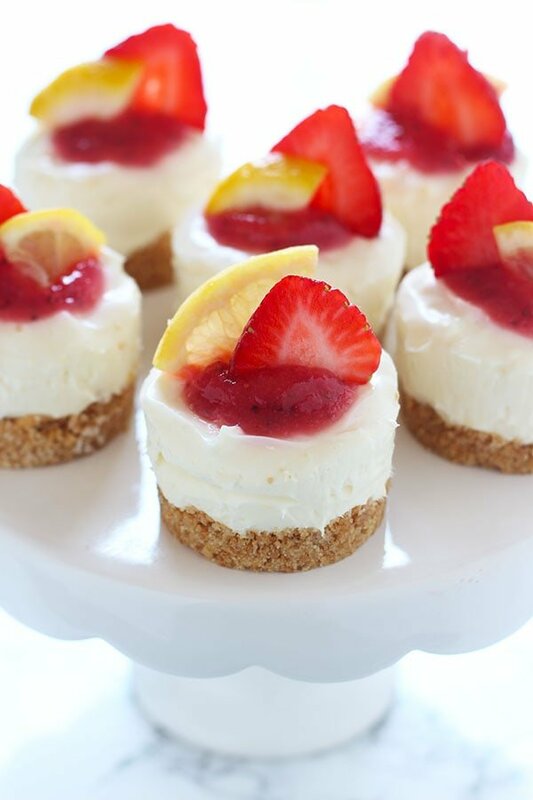 No Bake Strawberry Lemonade Mini Cheesecakes are adorably fresh, tart, and fruity and will be the star of any summer cookout! Taste: Just like actual strawberry lemonade, but better! Texture: The cheesecake is super rich and creamy, and is perfectly contrasted by the crunchy buttery crust. Ease: Super easy! Let the food processor and electric mixer do all the hard work for you. Pros: Ultra fun, adorable, AND tasty. Not to mention you don’t have to turn on the oven or stove once! The day I made these cheesecakes it almost reached 120°F here in Phoenix. Needless to say, I was NOT about to turn on my oven. Or stove. The recipes I had planned on testing that day had to wait, because something fresh and delightful with no extra heat required was simply a necessity. 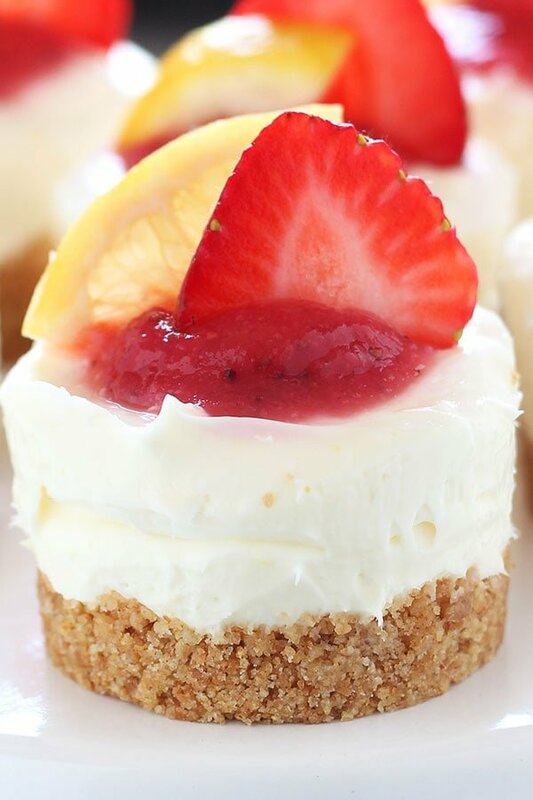 I’m almost happy it got so hot that day because I’m not sure I would have ended up creating these No Bake Strawberry Lemonade Mini Cheesecakes otherwise! 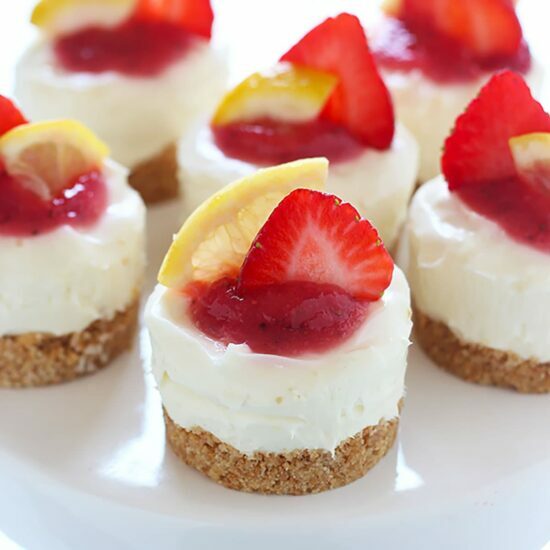 I just love how adorable and bright these cheesecakes are. You kind of get an idea of what they’re going to taste like just by looking at them! And they’re about a million times easier to make than a full sized baked cheesecake. This is a simple graham cracker crust made with finely ground crackers and a generous amount of butter to ensure the crust holds its shape since there’s no baking here. To make quick and easy work of assembling the crust, I like to take a heaping tablespoon of the graham cracker mixture and place it into each cavity. Then I take a shot glass or small tamper and to firmly press the crust down into the pan so it’s nice and compact and neat. If there are a lot of stray crumbs up the sides of the cavities I’ll try to brush them away so they don’t end up on the actual cheesecake. Make sure your cream cheese is at room temperature. Since there are no eggs in this recipe and we aren’t baking it, there’s no risk of overmixing the batter. That means you can beat it to oblivion to make sure it’s completely smooth and creamy with no lumps. You can also fill each cavity with cheesecake filling all the way to the top, again because there’s no risk of it overflowing while baking. Make sure you chill the cheesecakes for at least 4 hours, or until firm enough to hold their shape. This may take more time depending on your fridge and the weather, so I usually just chill overnight to ensure they’re firmed. The plain cheesecakes, without the topping or garnishes, can be stored in the fridge in an airtight container up to 2 days ahead of time. 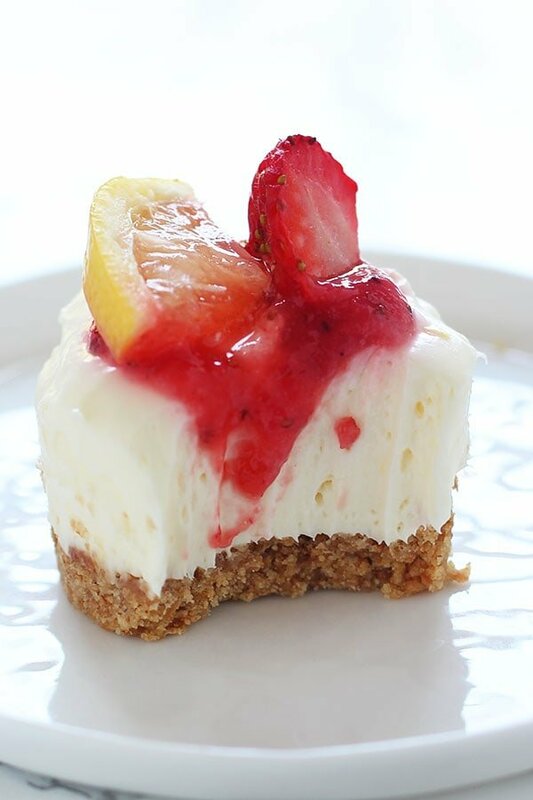 Once you add the strawberry puree on top, and especially once you add the garnishes, the cheesecakes should be served within a few hours to preserve their appearance. This also ensures the extra water from the garnishes doesn’t seep into the cheesecakes. Thoroughly grease a mini cheesecake pan. Place the graham crackers in the bowl of a food processor and pulse until finely ground. Add in the melted butter and pulse until moistened. Divide the mixture among the cavities of the cheesecake pan, about 1 heaping tablespoon in each. Firmly press into the bottom of each cavity (a shot glass or other small object makes easy work of this). Set aside. In the bowl of an electric mixer, beat the cream cheese and sugar on medium-high speed until creamy and well combined. Add in the cream, zest, and juice and continue beating until well combined and thickened. Divide the mixture among each cavity and cover with plastic wrap. Chill until firm, at least 4 hours or overnight. The cheesecake can be stored in the fridge in an airtight container for up to 2 days. Combine the strawberries, sugar, and lemon juice in the bowl of a blender or food processor and pulse until pureed. Top each cheesecake with a dollop of the sauce. Garnish with a strawberry and lemon slice. Serve. Definitely making these soon! It’s hot here in Houston too! I have 2 of the mini cheesecake pans. Love that you provide so many variations. The turtle ones were a big hit at Christmas. I should probably give up baking anything except for mini cheesecakes because they are so delicious and adorable! Really love cheesecakes… A two thumbs up for you! What type of heavy cream ? Is it okay to use condensed milk ? Instead of graham crackers what else can be used? Unfortunately mine didnt set. Clearly need a teaspoon of gelatine just to ensure they set! Can I freeze these ? Love this!! Just made this tonight except with blackberries instead of strawberries since they were on sale. Plus lemon and blackberry is a favorite combo of mine. They are chilling in the fridge more, can’t wait to try. I don’t have a mixer, can I use a hand mixer. Hey, so glad to see a “no bake” recipe that uses real food, not the fluffy product that wouldn’t be nice to mention by name. Depending on what berries look best, may use raspberries. In any event, thanks, thrilled to have this yummy idea in my dessert arsenal.